Only a few times in my life have I wanted to re-watch a movie right away. 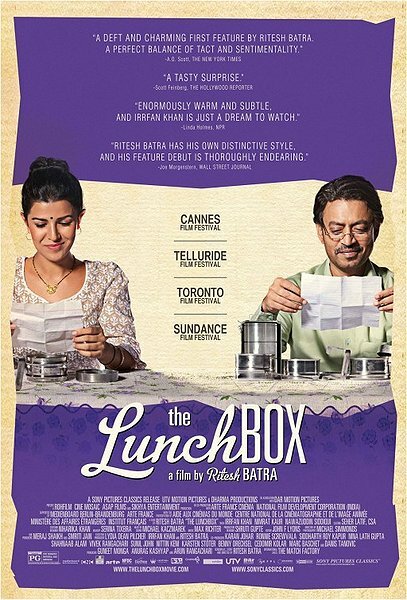 Ritesh Batra’s first feature, “The Lunchbox” (2013) hooked me within the first act. Imagine the life you live, when a short note of a few lines becomes your daily thrill. Here, we follow the quiet lives of disconnected people reaching across the urban noise of Mumbai, reaching for anyone who would listen. Centering around food, its is a seamless fusion of Satyajit Ray and Nora Ephron, with hints of Akira Kurosawa. Overall, it reminds me that as our cities get more crowded, we get more lonely. Ila (Nimrat Kaur) cooks lunch for her mostly absent husband (Nakul Vaid). An aunty (Bharati Achrekar) mentors her on cooking from the apartment above. Through cooking, she mentors her on life, always ready with the perfect recipe for every situation. Ila packs the daily lunch, and hands it over to a delivery man who takes it to a brigade of trains and bicyclists, to her husband’s desk. One day, however, the lunch reaches a stranger. 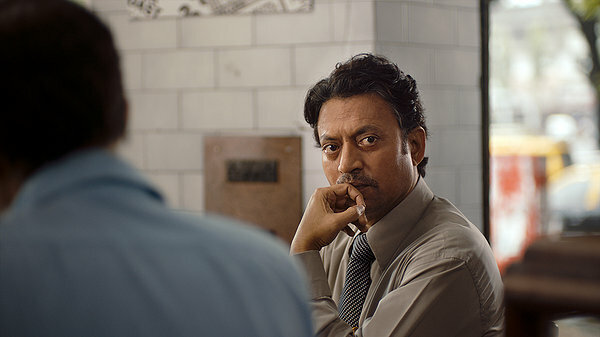 Saajan (Irrfan Khan) sits at a large desk in a large firm, processing claims with that mechanical, abrasive coldness of Kenji Watanabe (from “Ikiru”). Set for retirement, he must train the new-hire, the obsequious Shaikh (Nawazuddin Siddiqui), who keeps barging into his personal space. Saajan has his noon meal delivered through a local service, but today he receives Ila’s box, as he does tomorrow, and the next day. Through these lunchboxes, Ila sends short letters to Saajan, first commenting that the lunches are for her husband, not him. He responds, first commenting on her cooking, which is one day tasty, and another too salty. In these short correspondences, they share reflections, then secrets, then hopes, looking forward to the daily note hiding in the tin, rather than considering the food itself. Those two minutes become the highlight of the day for them, freeing them from the mundane routines. The big city speaks through the mix of human chatter and motor vehicles. Beneath the sounds, it relies on stability through bureaucracy, which itself relies on the enforcement of routine. Day after day. Week after week. Fiscal year after fiscal year. Two generations ago, in Ray’s “Mahanagar” (1963) families sought to join the industrial machine. To become part of the system is to have income, which yields a good life. Now, as the same machine compresses people together, allowing them to get lost as anonymous voyeurs, lost in experiments in disloyalty (including emotional and physical affairs), this current generation seeks to escape to something fulfilling, perhaps in the world of old. Iñárritu explored such urban loneliness in “Babel” (2006), connecting disparate peoples across the world through the passing and use of a rifle. In that film, the characters were unable to communicate, resulting in a crowded world full of language barriers and silences. In Mendes’ “Revolutionary Road” (2008), we watch a couple fantasize about the American Dream, first as a way to find direction, then as a way to avoid reality. In Bahrani’s “Man Push Cart” (2005) we watch New Yorkers meeting for bagels and coffee, meeting for drinks, while maintaining a distance from each other. In Ephron’s movies, we follow couples who meet via distant relationships before letting fate bring them together. Here, we watch one man who grieves through Bollywood reruns, a woman who longs for a smile from the husband who seems to drown himself in work, an orphan who hustles his way through his projects and marriage, and exhausted dutiful women who stay by their ill husbands’ bedsides. In all of these cases, we see yearning; unquenched thirst for something as simple as a hug. We witness so many relationships, so many smiles, yet so much loneliness. Part of the joy in this film is the wholesome goodness of almost all the characters. I like watching them because—even the ones with sharp edges in their dispositions—they lack malice. Rather, they are contending with a system far, far greater than them, be it the impositions of city life, or something even greater, like mortality. Further, a few points in Batra’s work really stand out. He directs eyes so well, as each of the characters think and process. Kaur pauses. Her eyes glance from side to side as she reflects. Khan’s eyes have a fixed, reserved expression in every moment. Siddiqui stares, grinning. His script bounces so well across time within scenes adding dimensions to moments already emotive. The characters relish in flourishes, in the way they might chew words before speaking, or fold their legs as they sit, or even close a window. Those extra steps give this film a life that in other movies might be distracting. Here, the film takes its time to unfold each scene slowly, in an environment always reliant on speed. And that slow, deliberate unfolding recalls the film’s implicit lesson: take a moment to give or receive a favor, enjoying the taste in every morsel. Better than that, cultivate your relations, with old school care and compassion. Otherwise, as we race against time, we always lose.